First in a series of Hawaii Blogs from my trip! If you follow my blogs you know I had become obsessed with going back to Hawaii…well I’m now blogging from Maui! My friend and I started our trip in Oahu, staying at two wonderful but different hotels – The Royal Hawaiian and The Kahala – and had a special dinner at Alan Wongs. I will get back to Oahu on a future blog. Let me start my series of Hawaiian Blogs with the special and little known island of Lanai. Only 13 x 17 miles in size and having no traffic lights…this is not a problem since there is no traffic! Population is 3,193. We arrived on an Island Air flight from Oahu and were met by a driver from the beautiful Four Seasons Resort at Manele Bay. The driver took us on a road winding down to the coast for the resort check-in – where the pampering begins with a lei greeting, cold drink and chilled cloth to refresh from our journey. We were taken to our spacious room with a lanai (terrace) facing the ocean…this would be nice any time but during whales season it was wonderful! 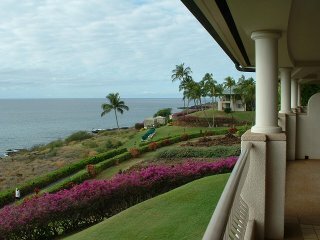 Imagine sitting on your lanai watching whales and spinner dolphins playing in front of your room. This area is where whales come to give birth in the warm water and play during the winter season, they were everywhere. We had lunch by the pool at the Ocean Grill looking out over the ocean…and the whales. One of the things I love the most were all the beautiful and colorful flowers and lovely grounds; lush green lawns and vegetation, many shades of green and bright colorful flowers along side clear blue water that you can see right down to the sandy beach. By Jan/Feb in Boston I long for color! After lunch it was time to change and head for the pool, where the beach staff does all possible to assure that you need nothing. During the day they come by with fruit skewers, water, sun screen and ice cold clothes to keep you cool. They will also spray you with Evian spritzers and clean your sun glasses…life at Manele Bay is good! They have beach chairs and cabana style chairs by the pool – No Charge. Kid’s full-day program – No Charge. After a busy day at the pool we ordered room service, arriving with orchards on the plates. The pool water was like bath water…I kept thinking this is January! I’m not sure how they do it, but in a very short time everyone seemed to know our name, they create a warm and comfortable environment where they seem to anticipate your every need before you do, you have to love the Four Seasons service level. So much more to come about my stay in Lanai and the other islands I visited.